To begin with: The 50GY represents the start of a huge waste water campaign which will see the manufacturer's delivery program double to around 500 pump types by the start of 2017. 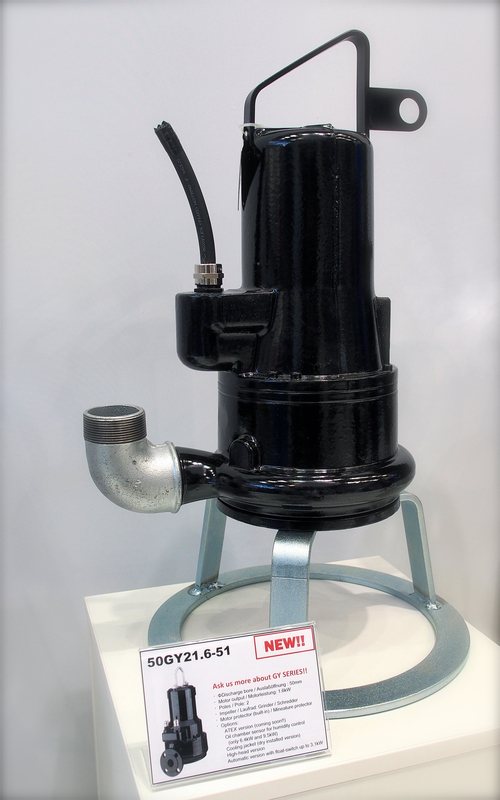 The smallest of the new pumps has a motor output of 150 Watt, the largest more than 160 kW. This is the first step by Tsurumi in its goal to become the market leader in the waste water sector. This Japanese company, whose European headquarters are in Düsseldorf, is already the global leader in the contractors´ pumps market. The 50GY is a series comprising 12 electrical waste water submersion pumps made of sturdy grey cast iron that can be installed in a free-standing position. With a motor output varying between 1.1 and 9.5 kW, they can pump up to 510 l/min to pumping heights of 68 m. To ensure that the waste water can flow without blockages, Tsurumi uses an open multi-vane impeller that turns at a speed of 2850 rpm. The grinder mechanism with its stationary cutting ring and rotating blade, chops the solids in the waste water in fractions of a second. This development works so efficiently that the manufacturer was able to make the outlet diameter just 50 mm to allow pipe cross-sections down to DN50, which in turn keeps materials and installation costs low. The cutting mechanism itself is a solid design made of just two parts, and is therefore very maintenance-friendly. Depending on their output, the motors are equipped with capacitor, direct or star-delta starters. Oil chamber sensors and float switches are available depending on the model; ATEX will be available as of 2017. All pumps can be combined with frequency converters to adapt to the mains supply. The pumps that range in height from 496 to 862 mm have a dry weight of 31.7 to 113.4 kg (free-standing versions). In particular, all have double slide ring seals on the inside, encapsulated ball bearings, thermal motor protection and individually cast electrical conductors; design features that stand for long service lives and low follow-up costs also for the sewage pumps by this manufacturer. For more information, please visit the Tsurumi.eu website.